Transsexuals don’t have to worry about the bathroom situation at the Democratic National Convention in Philadelphia, as the Wells Fargo Center is equipped with an all-gender restroom. 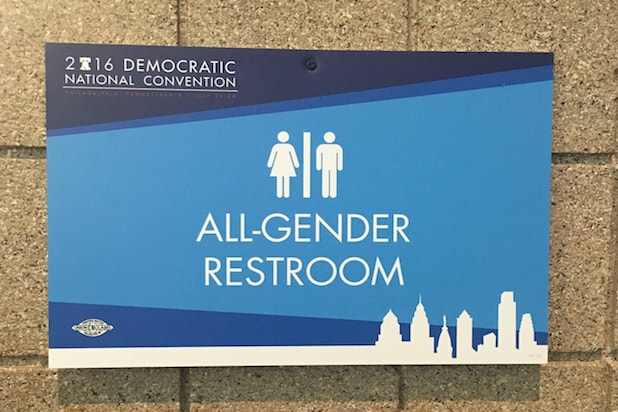 The DNC has transformed a standard women’s bathroom into the all-gender variety with a single sign, but the sign illustrates one of the key differences between the Democratic Party and the GOP. Last week, openly gay billionaire Peter Thiel called the on-going controversy over which bathroom transsexuals should use a “distraction” when speaking at the Republican National Convention. Gender-neutral bathrooms have become a major issue in America recently, with the Supreme Court even getting involved when it comes to the rights of transgender students and bathroom access at their local schools. The National Basketball Association last week pulled its 2017 All-Star Game from Charlotte, N.C. over the state’s controversial law that bans transgender people from using bathrooms in accordance with their gender identities. Perhaps the NBA should consider holding the event in Philadelphia, or at least consider letting the DNC arrange the bathroom situation.